The Benesch trade: could both teams lose? 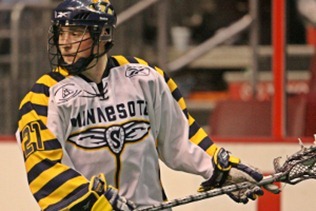 As you’ve heard by now, the Buffalo Bandits have acquired sniper Ryan Benesch and transition man Andrew Watt from the Swarm for two first round draft picks (2015, 2016) and a third round pick in 2017. This looks to be a great deal for the Bandits, who lose nobody from their roster while picking up two solid players including Benesch, a former rookie of the year and league scoring leader. It could also be great for the Swarm, who just love their first round draft picks. But it could also be a disaster for both. The Swarm had four first round draft picks in 2012, and they have four more in 2013, including one of Buffalo’s (from the Cosmo deal). Now they have Buffalo’s first round picks for 2014 (Cosmo again), 2015, and 2016 as well as their own. This, plus Philadelphia’s 2015 pick from the Kevin Ross trade, gives them at least eleven first round picks over the next four drafts. This is a bit of a strange deal for the Swarm, on the assumption that Benesch didn’t ask for a trade. As I said, they certainly love acquiring first round picks, but I’m not sure it makes sense to give up someone who’s a star now for draft picks. I get that first round picks are important and can change a franchise entirely (right Edmonton Rush and Pittsburgh Penguins? Or the 2013 Swarm for that matter), but the best-case scenario for the Swarm is that they are able to draft someone as good as Benesch. If Benny was 34 and one of those “still pretty good but on the downside of his career” players, it might make sense, but he’s only 28 and could easily be at or near the top of the league in scoring for the next five years or more. Even if the first of the draft picks they got results in the next Mark Matthews, they still have 2 full seasons of no Benesch and no Watt before then. They do have four first-round picks this year, and if they want to get them all on the roster, then four players from last year have to go. They’ll likely want Andrew Suitor back in the lineup, so that’s one more. But I don’t think Benesch and Watt were at the top of John Arlotta’s “list of players who can be dumped in favour of rookies”. In addition, this trade has made the Bandits better, so it’s unlikely that the Bandits’ first round picks will be all that high anyway. Meanwhile the Bandits have no first round picks for the next four years. It’s now safe to say that the Cosmo deal was a bust, in that Cosmo has only shown glimpses of the former Goaltender of the Year the Bandits hoped they were getting. Indeed, 2012 and 2013 were the worst seasons of Cosmo’s career in terms of both GAA and save percentage. The Bandits have not yet given up anything for Cosmo – this year’s draft will be the first of the two first-round picks they gave up. But unless Cosmo recovers in a big way next season, the next two drafts might be tough to swallow for Bandits fans. If the Benesch deal doesn’t work out for whatever reason, the two drafts after those might be just as tough. There would be nothing worse for Bandits fans to head into a draft knowing you have no first round pick this year or next because of a trade for a player that hasn’t played for you for two years, but if Benesch is traded again, that could be the case. But Steve Dietrich knows this. With this trade, the Bandits are going all in with Benesch as their offensive leader for the next half-decade. Obviously losing John Tavares will hurt, whether he retires now or after another season, but with Benesch as the new offensive go-to guy, the Bandits can handle it. That’s something they’ve never really been able to say before. Not saying Benesch is on a par with Tavares, arguably the best NLL player ever, but if you’re looking to replace a strong lefty scoring threat, you could do far worse. I have no reason to believe that Benesch won’t be successful in Buffalo. If he does take over John Tavares’ spot as the offensive leader of the team, the trade may work out very well for the Bandits. And if the Swarm’s 2013 draft picks work out as well as their 2012 ones did (Matisz, Jackson, Sorensen, Crepinsek), they may be able to survive the loss of Benesch and Watt pretty well. All trades take time to determine who the real winners were, in some cases a few years. If it takes that long to decide the winner of this deal, it’s likely the Bandits came out on top. But if Dietrich’s bet on Benesch doesn’t work out, things could be pretty bleak in Buffalo for a long time. One of the biggest stories of the 2013 NLL season was the parity in the league. The best regular season record was only 4 games better than the worst and as was stated many times during the year, any team can beat any other team on any given night. But is that really what we want? Certainly there are advantages to this level of parity. The bit about any team can beat any other team ensures that the majority of games are meaningful and exciting. If you look at the IL Indoor staff picks every week, there were a few times where every person chose the same winner in a game, but that was pretty rare. But how many games were there last season where you were truly shocked by the outcome? I’m not talking about lopsided wins or high- or low-scoring games here, just being shocked by who won the game. 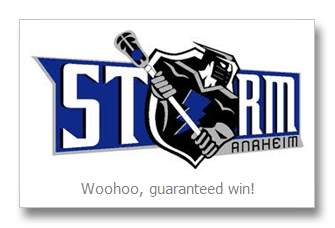 In 2004, the Rochester Knighthawks (coming off three straight 10-win seasons – one of them in only 14 games) travelled west to meet the Anaheim Storm, who were in their inaugural season. The Storm defeated the Knighthawks 13-10 for their only win that season. The fact that the Storm pulled off that win was a complete shock to everyone – to the point where I remember it happening nine years later. Were there any games last year that are that memorable strictly because of who won? One of the advantages of parity is that every team has a chance to win the Championship. But one of the disadvantages is that every team has a chance to win the Championship. Were the Knighthawks the best team in the NLL in 2013? No. In 2012? No. But they have two Championships in two years. In both years they made the playoffs and then won three straight games, so you could argue that they deserved both titles and I wouldn’t argue against you. But the league Champion is supposed to represent the best team in the league that year, not the best in the final three games. If winning the Championship doesn’t mean you’re the best team, what does it mean? Doesn’t it kind of lose some significance if you have two teams with 11+ wins but the Champion is a team that’s only a single game over .500 including the playoffs, as the Knighthawks were in 2012? Another disadvantage of parity is the legacy. People look back and remember the years when one team was dominant. Remember the Rock of the early 2000’s? What about the 1993-1994 Bandits? Or the 2007 Knighthawks? In other sports we have the Canadiens of the 70’s. The Islanders and Oilers of the 80’s. The Yankees of the 90’s and 2000’s. The Bulls of the 90’s. The Lakers of the 2000’s. Those teams were all dominant, and we all remember those years and those Championships. Quick – who won the NLL Championship in 2006? Mammoth fans probably answered right away, but I had to look it up. Not the Mammoth didn’t deserve their championship, but they weren’t part of a dynasty and didn’t have nearly as dominant a season as the Knighthawks the next year (with their 12 game win streak to end the regular season) so it’s a little tougher to remember. In ten years, who’s going to look back on the 2012-2013 Knighthawks and say “remember when those mediocre Knighthawks won two straight Championships”? If they finish around .500 in 2014 but win their third straight Championship, would anyone consider them a dynasty, or even close to one? You (generally) don’t have to watch your team struggle through a 3-13 season. You don’t have to go to a game and think “we have almost no chance of winning this”. When you watch a game, you know it’ll be a hard-fought game on both sides. You know that the players aren’t going to be mailing it in because “it’s only the Edmonton Rush and we can beat them easily”. Not anymore, you can’t. Not easily. Even if your team is below .500 with only a few games to play in the regular season, the games are likely still important. There might be some lacrosse fans who consider the Knighthawks’ recent championships as less meaningful than previous years, but Knighthawks fans don’t. The same rule that applies to goals applies to Championships as well: the ugly ones count just as much as the pretty ones.